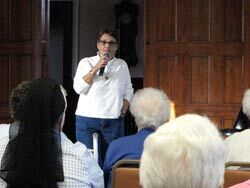 Volunteer Christina Brodie details the new Hands Across Our Community program to sisters at the Nazareth Mother in December 2012. If you remember the classic TV commercial with the line, “Pardon me, would you pass the Grey Poupon?” then you’re already familiar with Christina Brodie’s work. Now the woman who laughingly describes herself as a “big-time ad executive” has dramatically changed her direction and her locale — by coming to Concordia as a full-time unpaid volunteer. The next time you see Brodie’s work it will be in the form of a new, long-term anti-poverty program she is helping to design and will coordinate for the Sisters of St. Joseph. The path that led the 61-year-old to rural Kansas began in her native New York City, where her grandfather had arrived as an Italian immigrant in about 1915 with $20 in his pocket. Their daughter eventually was able to attend Rutgers, the State University of New Jersey, where she majored in Third World History and Communications. While in college, she married and then she and her husband launched their careers. At 28, she was the youngest vice president — of media planning — with the New York ad agency Lowe Marschalk. 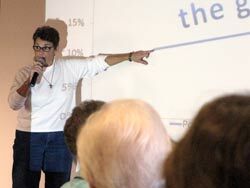 “In the 1970s and ’80s, we Baby Boomers were interested in moving up the ladder and acquiring things. It was also during that time that her marriage ended, and she petitioned for and received an annulment through the Church. So, as a single parent, she quit her job and moved her toddler son and mother to Florida, with the hope of building a slower-paced life. For the first time, she says, she had both the time and inclination to try to help out without getting paid for it. Then she returned to work, this time for McFarland & Drier Miami, and then a few years later with Office Depot as the vice president of advertising at its world headquarters in Delray Beach, Fla. In 2006, she returned to New York and a job with Maxus Global, a part of the GroupM media agency network. In her position as partner and group planning director with the massive advertising and marketing services network, she worked on major accounts including Korean Airlines, Chrysler/Jeep/Dodge and NBC Universal. She also began attending Manhattan’s St. Francis of Assisi Church and her commitment to volunteering grew. In time, she joined the Third Order of St. Francis, a fraternity of Catholic men and women often called Secular Franciscans. After a handful of years with Maxus Global, Brodie realized it was time for another change — and this one might very well be the most dramatic so far. “The timing is about Chris being centered in his life,” the proud mom says. “As we’ve moved into the 21st century, there has been a shift in what’s important to all of us. Today we think about ‘quality of life’ instead of just the job. Then she developed a plan to pay off all her debt and divest herself of all but the most basic belongings. 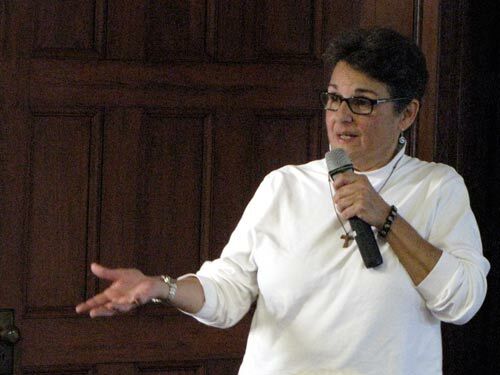 When she was finally ready — with only the possessions that would fit in her car — she started searching the Catholic Volunteer Network for a full-time position where she could live as part of a religious community. At the same time, the Sisters of St. Joseph had listed an urgent opening for someone to lead a poverty outreach program in Concordia. Sisters, local clergy and numerous community volunteers had been working on the program for more than a year, but it was languishing without a dedicated individual to spearhead the work. Brodie visited Concordia for the first time in October (2012). By early November, she had returned — and now lives at Manna House of Prayer, with seven Sisters of St. Joseph. As a full-time volunteer, she receives free room and board as part of the Manna community and a small monthly stipend. I am so proud of Christina and her unstoppable drive to make the world a better place, one step at a time! May she continue to be a blessing to all, as she is blessed by many! May the spirt always stay with you, and know my blessings, thoughts and prayers are always with you.